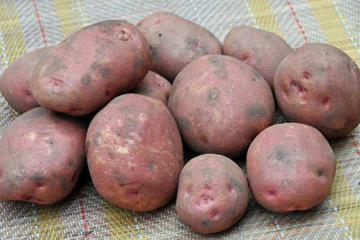 Late Main Crop potato producing large tubers with patchy reddish pink skin and pink eyes. Creamy white, soft, moist waxy textured flesh. Strong bushy growth habit and crops well in most situations. Apart from the redder skin, similar to the normal 'Cara' but perhaps even more robust growing - a very good variety.